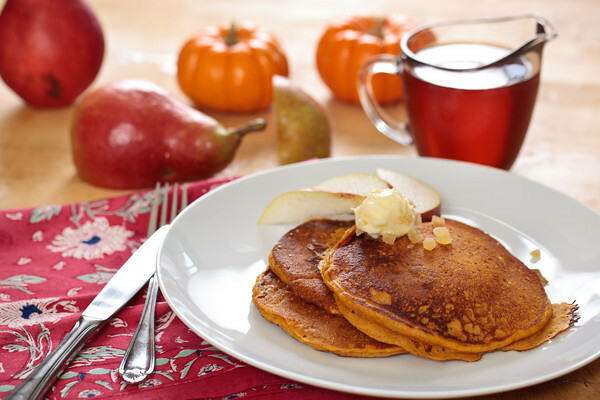 pumpkin pancakes + pears = Fall at its best! In medium sized bowl, sift together the flour, salt, brown sugar, baking powder, baking soda, cinnamon, nutmeg and powdered ginger. In a separate bowl, combine the remaining ingredients. Add the flour mixture and stir until just blended. Heat pancake griddle and grease (we use butter). Use not quite ½ cup of batter per pancake. Serve with gingered butter and warm maple syrup. This will serve 4 with 2 large pancakes each. Beat ginger and butter together. This keeps well in the fridge. Recipes come into our kitchen from lots of places, this one was brought to us from our former innsitter, Dana McCready. Thanks Dana for this great addition to our kitchen!